“The Mole’s Dream” (in the Czech original called “Krtek ve snu”) is a short cartoon movie, which was made in 1984 by Czech animator Zdeněk Miler. Nowadays, we are imaging IoT for a better life, and more and more companies are doing IoT business to create a smart world. People are always dreaming good things, you see, the concept of IoT world was well animated, even in 1984. But that world in the little mole’s dream collapsed when there is no gasoline, no electricity. Then there was cold, even no food, and the man was frozen. But thanks to the helps from the mole and other animals, he survived and got back to a natural life. It’s very clear that the energy is the most important, whatever for creatures or man-made stuffs – machines. Human need food to survive. Human can move to anywhere to get food and make food. Machines need gasoline or electricity to service human. But until now the most of machines cannot get power supply by themselves. We are doing IoT for business and “we have total solutions for IoT ” as most IoT companies said in their propaganda. Actually, we have to do IoT business from for small things and make simple applications firstly, because the world is not really ready for IoT, and the machines and the edges are not smart enough. We think, in a real IoT and smart world, the machines need intelligence and education resources, therefore they can learn themselves. The machines need smart energy supply, then they can renew energy supply without human being intervention. Making machines smart, connected each other, then survived by themselves. This is our goal and we are already on the road. Mr. Zdeněk Miler is a great animator with scientific visionary. In his another short movie “The Mole in Town” (released in 1982) (in the Czech original called “Krtek ve městě”) , the mole and friends’ forest was cleaned up and a new town was fast built there.The mole and friends were invited to the city…and the mole went to a doll workshop and got its own copy doll quickly from a flexible production line after the mole was 3d-scanned. How Mr. Zdeněk Miler is so forward-looking! It seems he knew customization and industry 4.0 in more than 36 years ago. We like the mole and its stories. Hopefully you enjoy them as well. And the industry 4.0 and IoT world will come true and they are coming indeed. Even our world is changing faster, but it still takes some time. Again, let’s engage for that and step by step to make machines smart, connected each other, then survived by themselves. 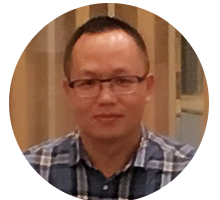 DQ-Han Wang is the founder and General Manager of Dadax Software.